Oh Boy! There’s a New Hot Spot on Westminster! I’ll start with an admission: When it comes to food, I like it spicy. Since my collegiate youth spent in Western New York in the late ’80s when the rest of the country thought the wings were the part of the chicken you threw away — had I only had the foresight to imagine a day people would buy Buffalo wings in the Tokyo airport — I have enjoyed a little heat in the right dish. Now, I am not a glutton for punishment in this pursuit. I like that kick that enhances the other ingredients and doesn’t overwhelm them. Which is why I was so curious about the recently opened Westminster Street spot O’Boy and their “Spice Challenge.” Their charmingly enthusiastic assistant manager, James Lee, a 2016 Johnson & Wales grad, as is chef/owner, Jaewoo Choi, explained that they rate the spiciness of their dishes on three levels. The first is simply “one,” the second, “two” and the third is “Korean.” Korean is the challenge. Finish an entree at the Korean level of Scoville units (the universal measuring system for rating the heat of a pepper), and you win a free drink or dessert. The basis of the “Spice Challenge” changes from week to week based on ingredient availability. During my visit it was jerked chicken. They incorporate the same idea on their house zuppa, an Asian take on the classic Italian soup. In lieu of the clams and oysters that an Americanized version of the dish incorporates, Choi again uses a rotating main ingredient in a consistent broth. The week of my visit it was skate, a saltwater fish similar to a ray, served in a base of ginger vegetable broth, scallion and butter. Like its Italian cousin, it’s served with a crunchy toast ideal for dipping. Choi imagines these innovative and unique dishes in a ventless kitchen that uses no grilling and no sauteing. After graduating from JWU — following a high school course of study in culinary arts and sciences in his native Korea — he did time in New York City kitchens, but always dreamed of returning to his college home and opening a restaurant that embraced fermenting, pickling and sous-vide cooking techniques. Nope, I didn’t know what that was either. It’s a technique in which food is placed in a watertight container and then cooked in a water bath for an extended period of time. It proves ingredient- and cost-efficient, and in Choi’s hands, absolutely delicious. The dishes that come out of his kitchen are spectacular. I sampled the buckwheat crepe, filled with a house-made kimchee that was moderately spicy, but bursting with added flavor from caramelized onions and a nice crunchiness from fresh cabbage. My second selection, the house O’Steak, was a dream for a lover of meat prepared rare. It was simply the perfect shade of pink and given a delicious char via blowtorch. Surrounded by a fingerling potato confit and a carrot jerk that was remarkable, the only thing that could complete it was a pickled pearl onion. And, it did. The cocktail menu was equally adventurous. I sampled their “Aloha from Japan,” a fantastically refreshing mix of sake, Malibu rum, pineapple juice and mango puree, which could not have been more perfect on a 90 degree day. I was intrigued by “The Murderer,” which Lee told me was their take on the Bloody Mary, replacing Worcestershire Sauce with whiskey shoyu, a non-alcoholic soy sauce fermented in whisky barrels. O’Boy also serves a wide range of Japanese and Korean beers and sakes that seemed popular among the after-work crowd. This was a group of early adopters who seemed smart and arty, but not so hipster that a more mature palate would feel out of place. The appropriate volume of the cool indie beats allowed for easy conversation in the bar area. As for me and that Korean sauce? Well, obviously I had to have a taste. I was brought a small sample and eyed it with apprehension. 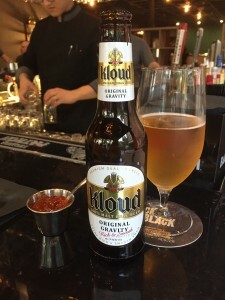 The initial sweetness of the mango/pear puree base was absolutely delicious, but when the back end of Korean red pepper flakes, habanero and cayenne snuck up on me like a late-breaking curve ball, I was glad to have the premium Korean beer, Kloud, at the ready. Yet, it was tasty enough that I had to have a second taste. My next visit I’ll go for the number two. And, I will be back.